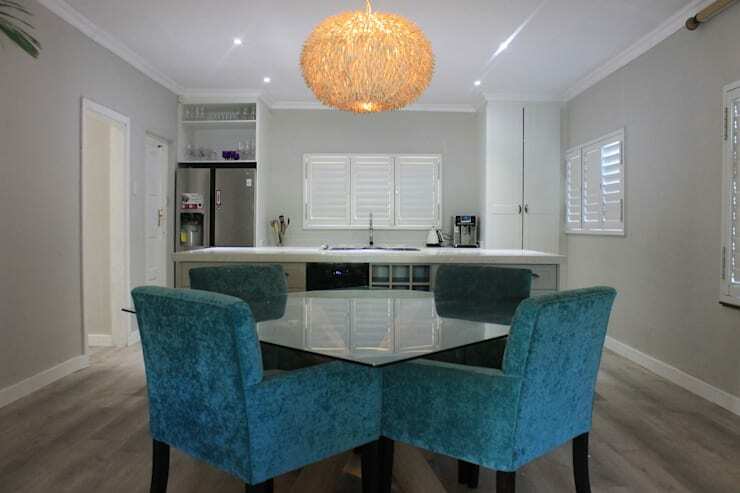 When we think of holiday homes, we often forget or neglect to pay as much attention to the interior design as we would have with permanent residences. When we are on holiday, decoration is not really high on our priority list, although a well-decorated and tasteful dwelling would certainly improve the quality of our vacation time a great deal. We start our tour of this home's interior in the living room area. At first glance, there is no doubt the great taste and elegant design had been the building blocks of this room. A classical style is immediately evident, and is emphasises by the sober use of materials, lengthy curtains, and of course, the chandelier in the centre of the ceiling. Bulky, grey furniture had been used as the main constituents of this room, placed in a cubic, floating arrangement around the living room space. 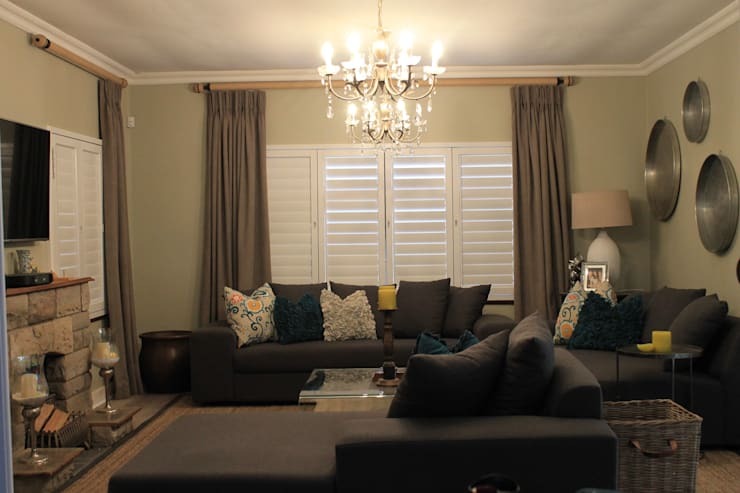 Darkly coloured pillows in rich textures are dotted across the room to bring in variation. In the dining room area, we can see the strong presence of several statement furniture pieces. Besides these, there is very little decoration of superfluous pieces, which gives the room a minimal chic and streamlined elegance. The small, cubic dining table consists of a glass table-top, the transparency of which adds a more fluid character to the room and extends the sense of available space. Accompanying this feature, we can see four supremely sophisticated, blue velvet chairs. This brings in a calm and sensuous colour that carries the tonal weight of the entire room. To top it all off, we can see a texturised chandelier hang above the dining space. The warm colour and layers of depth this provides, is truly enviable. Over to the kitchen, which is situated just behind the dining room space in this open-plan area. This very modern kitchen is an endless expanse of visual space, thanks to all of the features being covered in white. We can see that the walls are in a little darker tone than the cabinets, counters and window blinds, but this brings in some variation. Who ever said all-white has to be boring?! 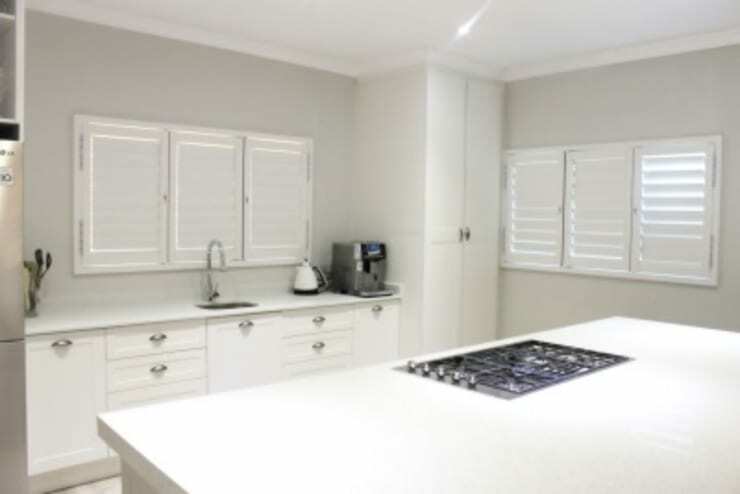 This style of kitchen does not only embody the values and aesthetic character of minimalist design, but is also super easy to clean and maintain. A winner on all fronts. Now we move on to one of the bedrooms in the house. Here we immediately get that holiday-home feeling that was not necessarily so present throughout the rest of the interior. 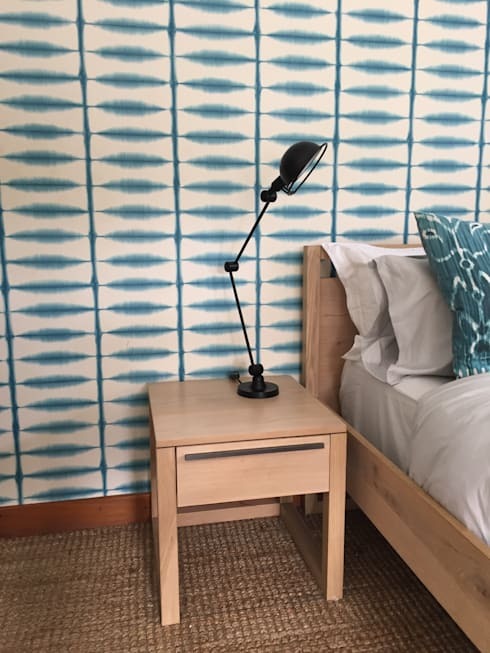 The laid-back and calm atmosphere of this bedroom is carried mainly by the wallpaper, which expertly combines a serene blue colour with an undulating pattern. In addition, the light wooden furniture used in this room is very warm and welcoming, perfect fixtures for the background. We finish our tour of this elegantly designed interior with a stop at a very intimate area of the house. 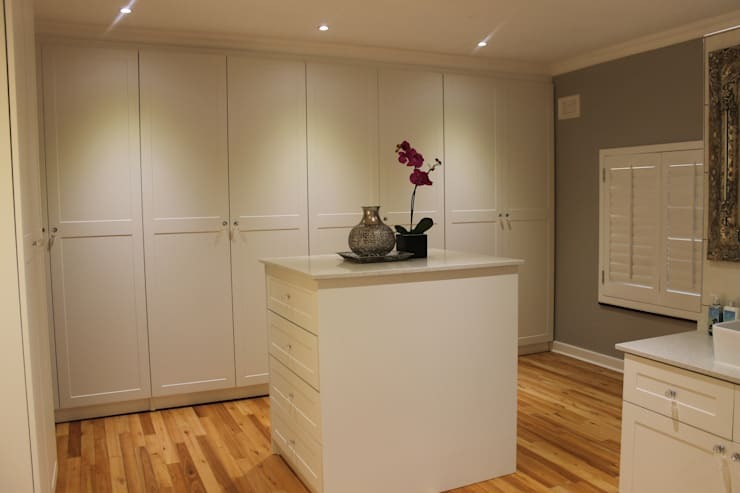 In this image, we can see the walk-in wardrobe of the master bedroom. Now this is quite the luxury to have in any home, not to mention a vacation residence! What is most significant about this space, however, is its undeniable sophistication. Clear, bold cupboards and drawers meet a hardwood floor, and it is all topped with just a few strategic ornaments in the form of a silver vase and orchid plant. Doesn't it look just like a magazine shoot? Speaking of, take a look at how you can make your bathroom look like it came straight out of a magazine. If it ends up to be anything like this spectacular home's interior, you definitely did something right! Let us know what you thought of this home in the comments!